Gobsmacking narrows, tall arches, and the Cadbury’s Chocolate Factory wharf at Knighton #narrowboat #England – The Diesel-Electric Elephant Company. Not so much, I think, of a “cutting” as it is a “slash”. Narrow isn’t the word for it – and, yes, I met a boat coming in the opposite direction. They aren’t kidding, either. This stretch is occasionally closed by rock falls and landslides. Almost three-quarters or so of the way through the Cardinal and I met a boat travelling in das oppositen direction… but fortunately, they stopped and tucked themselves into one of the squeeze-past places. I’m not overstating matters when I say “squeeze past”, we had maybe six inches spare between boats and still we both scraped on the silly underwater obstructions of the sides. On the scale of “Chatty and Friendly people” I’d rank the folk on the boat at about ‘North Korea’, maybe a smidgen less. They did stop and wait, which is quite something, all things considered, (albeit motivated, methinks, by their paintwork and by the obvious overgrowth and outgrowth where I was when spotted), and perhaps Human wasn’t their first language. 😉 ‘Good morning’ is such a very complicated phrase, and contains some awfully long words, so it is no wonder that not everyone can handle it. Woodseaves Cutting, Shropshire Union Canal. That’s the towpath to the right, and under those ferns to the left are solid rocks. The main thing is that, representatives of North Korea notwithstanding, the Cardinal and I made it through without hearing descant recorder music (USAean equivalent: “banjo music”) and without having to entertain any inbred locals with six fingers and a hankering for various ways of enjoying the flesh of outsiders. Perhaps if they raised the canal water by ten feet and flooded the whole thing it might be considered wide enough to be sensible? The Greek and Roman gods alone know what this place must be like during the height of the summer (and hire-boat) season. Wall to wall chaos, perhaps? Once through the cutting the scenery and width revert to their more usual form, and jolly grateful a chap is, I can tell you. By this stage the day had worn on, the wind was beginning to pick up again and there was a decided excess of coolth about the air – I was sporting my usual attire of one “Michael Jackson” glove for my tiller hand, the other hand being hidden away in a pocket. I just can’t do throttle controls, and I can’t do ropes and mooring, in gloves. No idea why, it just won’t work for me, so one glove it is generally. The route took us through an interesting bridge, one that was under repair. I mention it only because the scaffolding was total, and some contractors with extreme confidence in the skills and steering accuracy of boaters had placed some of the scaffold supports right on the edge of the canal itself… No photographs, I was too busy concentrating on getting us through without bringing scaffolding and semi-repaired bridge down on top of us! A short stretch of “Middle Earth” dingly dell canal, all bridges and overhanging trees, saw us to the start (or end, depending upon your vector, Victor) of the Shebdon Embankment and the (now defunct) Cadbury’s Chocolate Factory wharf, the Knighton Wharf. The old Cadbury’s Chocolate Factory wharf, now part-neglected and abandoned, part let out to “Long term” moorings. The old Cadbury’s Factory wharf, from which much milky goodness was shipped to the Nation. The Cardinal and I are now moored for the moment at the far end (ish) of the Shebdon Embankment, near another place cunningly named “Shebdon Wharf”, and from which no chocolate at all was ever shipped. It’s a bit windy and rainy, so we’re staying put until it is less windy and rainy. The embankment has crinkle-cut edges, whether designed so or not they do rather disincline one to attempt mooring, since no fender in the world has been invented to cope with their ins and outs. We plonked our ropes down on the first moorings to present themselves with civility, and with mooring rings. I know that it looks in this photograph as though we have parked on a bend, and indeed it is so, but the photograph is misleading, the bend mild and the moorings official. There is plenty of room and angle to see and be seen, and lots of width here to pass. Shebdon Wharf “visitor” “48 hour” moorings. Three and a half miles remain to be done in the next week as a minimum to get us ahead of the Canal and River Trust’s scheduled “winter stoppages”, where parts of the canal are closed for work and repairs. We mun get our stern past Norbury before the 5th of November. I’ll pick a likely day, and mooch along soonest. I tell you, it’s all go on the canals. In terms of “oomph” I feel quite horizontal, and it is fortunate that I have a seating arrangement that, at the flick of a lever, accommodates just such a medical condition. Being not so green as I am cabbage-looking, I have also cunningly arranged a footstool in just such a position as to hold a pair of feet at the correct height in front of “Mr Stove”, and placed within arms reach several dozen of the Cardinal’s many dozen feet of bookshelf. Treatment is in hand. May the wind and the elements smile upon us. They are certainly not smiling upon the souls boating past us. I have no idea where the time goes to on the canals. October has all but evaporated. We haven’t seen a shop for fresh victuals in a day or four, so edibles are in the ship’s biscuit line (recipe here, opens in new window). Hmm. Pasta, curry, something of the noodle or soup and a bucketful of croutons, perhaps, for dinner? I think I’ll just close my eyes, listen to the wind and the rain lashing, and think about that for a while. Ye gods, it’s wild out there. Oh that’s good, the fuel boat, Halsall has just cruised past, heading south (as am I), looks like they will be on the other side of the winter stoppages with us. That makes things so much easier! A well earned foot-putting-upness. 😀 … I was wondering of that Pass of Cirith Ungol was a result of encroaching greenery, but no they dug it like that deliberately, eh? I doubt that even Gerties Goon Show could’ve followed you through there. You may have escaped their dire clutches at last! Austere looking buildings even for chocolate making, you can see the old industrial world leftover from the canals. But then it was all a lot slower in those days and I expect that even chocolate was an unknown commodity for some folk; I guess in those days you died before you could become obese! I think that the factory and probably this version of the wharf opened in the nineteen-twenties. The factory behind looks about as drab and drear as it is possible to get, the wharf building has solidity, but no frills – possibly a lot has been removed over the years. 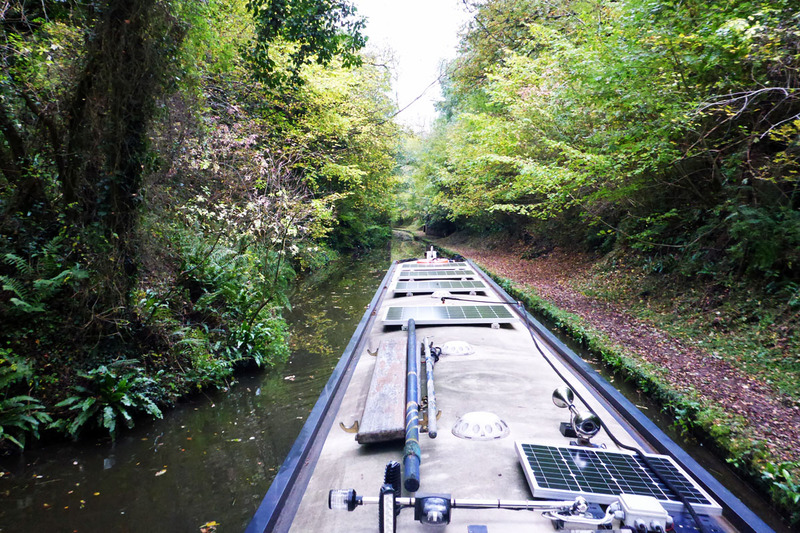 The canals are fantastic for seeing everyone’s back gardens, all of the otherwise hidden parts of England! Goodness. It looks like it was BUILT that narrow. I wonder how they managed it with commercial traffic. One assumes it was fairly constant with the factory just there. No radios or radar or satellite reconnaissance. And poor draft animal! I wonder how many slipped into the canal. And how one gets the damn thing back out of the canal? I’m now worried about a situation that has been in the past for a hundred years. Welcome to my brain. I can’t imagine how the early commercial boats managed, every boat then was on its own contract so there was little to no co-operation! Time meant money and there wasn’t a whole lot of either around. The boats then also worked through the night, they couldn’t afford to stop, so would have cruised wonders like this in the dark, before LED headlamps and torches. Amazing stuff, I doubt we could make it work today – there would be too much paperwork! I’m gonna guess a good few animals fell in in the dark. Even if they were led, the human could easily slip in and then it’s just inevitable.